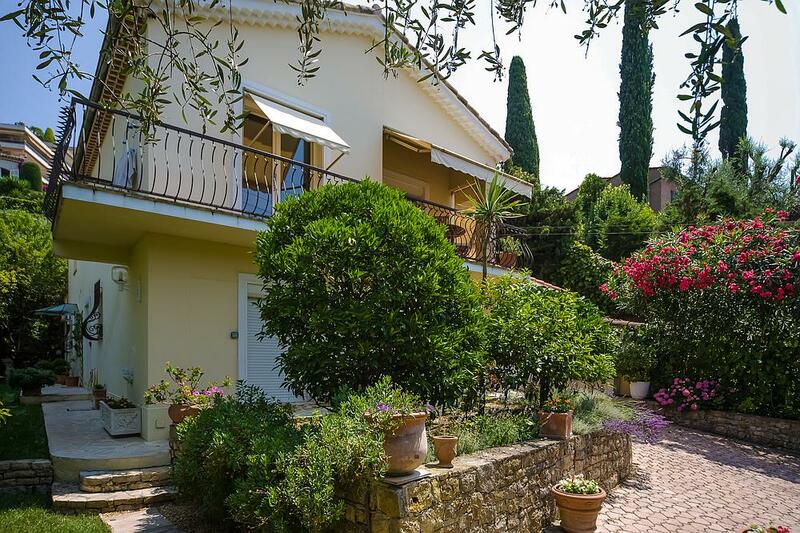 Villa Framboise is a charming holiday villa in France with private pool, well appointed throughout and located in a residential area of Le Cannet, just a short distance from the town centre and the well known Rue St Sauveur with its restaurants and boutiques. 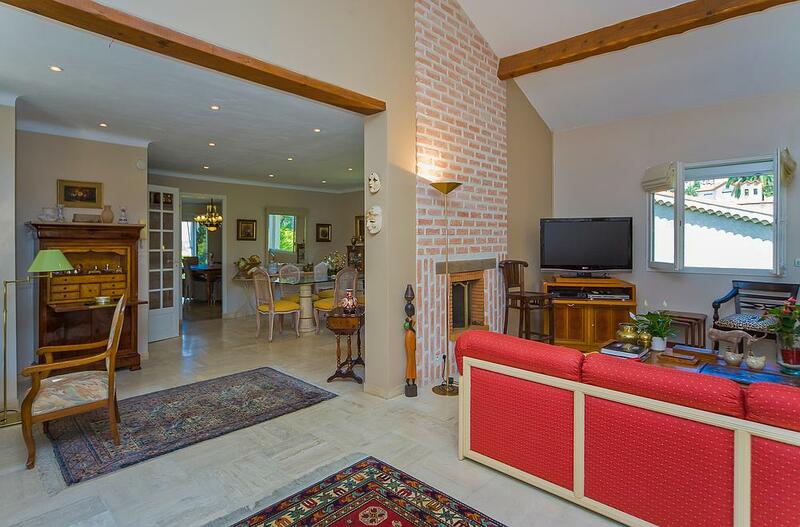 It is elegant, cool and bright with a spacious living room which leads to the garden and swimming pool via two large French doors. The garden is colourful and well maintained with plenty of shady areas, meaning long summer evenings dining al fresco are assured. 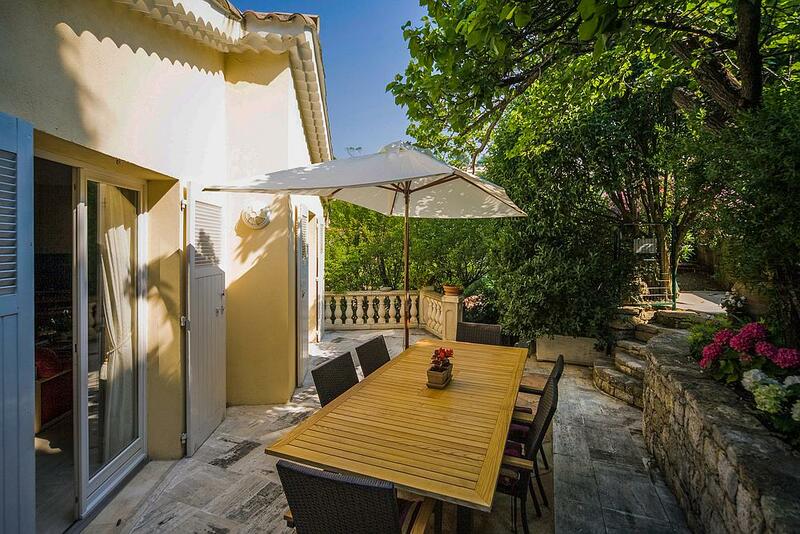 For those who like a little more adventure, the delights of the film festival town of Cannes are but a short drive away with nightlife and large sandy beaches, or the historic town of Antibes is also easily reached. 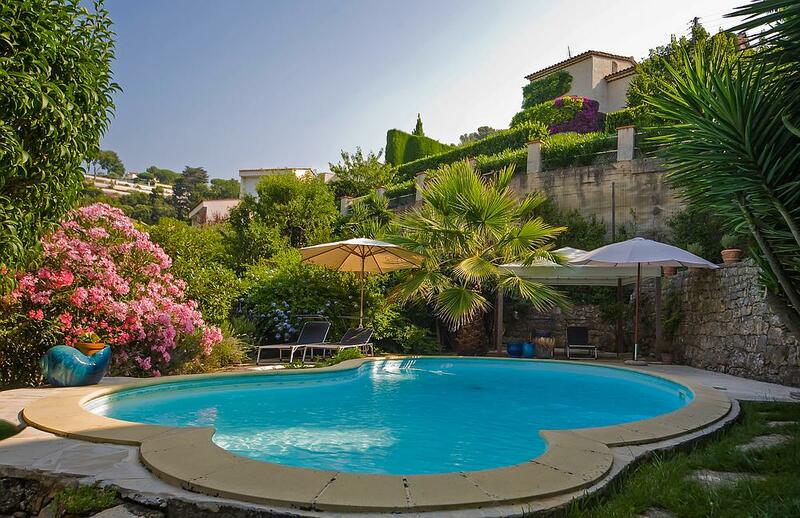 This holiday villa in France with private pool is perfectly situated to explore this part of the Cote d'Azur. Included are 2 hours maid service per week. Wi-Fi internet. Pool towels. Winter heating. Extras: Additional maid service on request. Air conditioning €150 per week. Supplements apply for Cannes festivals - please ask. 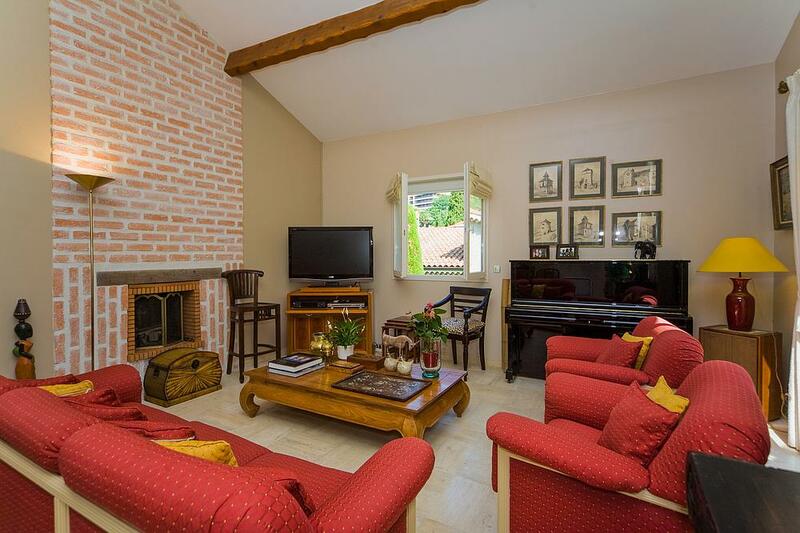 Spacious living room , open fireplace (TV, stereo, piano, DVD, video), French doors to upper garden and swimming pool area. 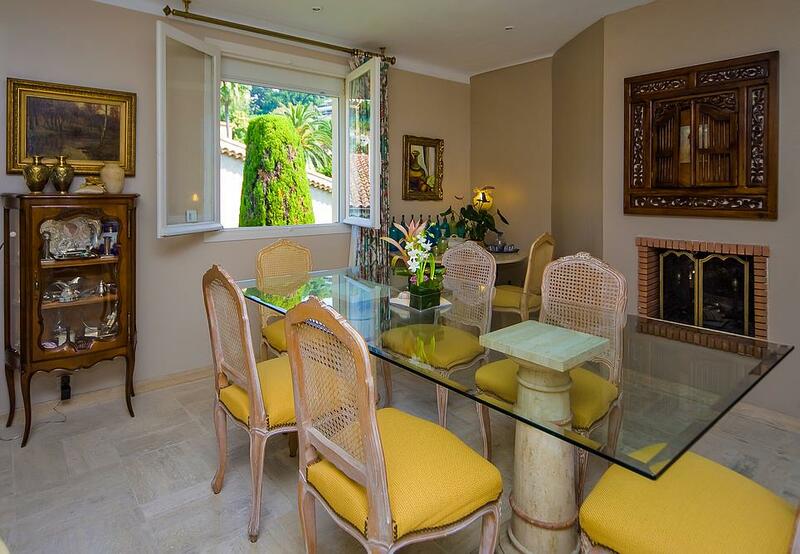 Dining room , air-conditioning, open fireplace. 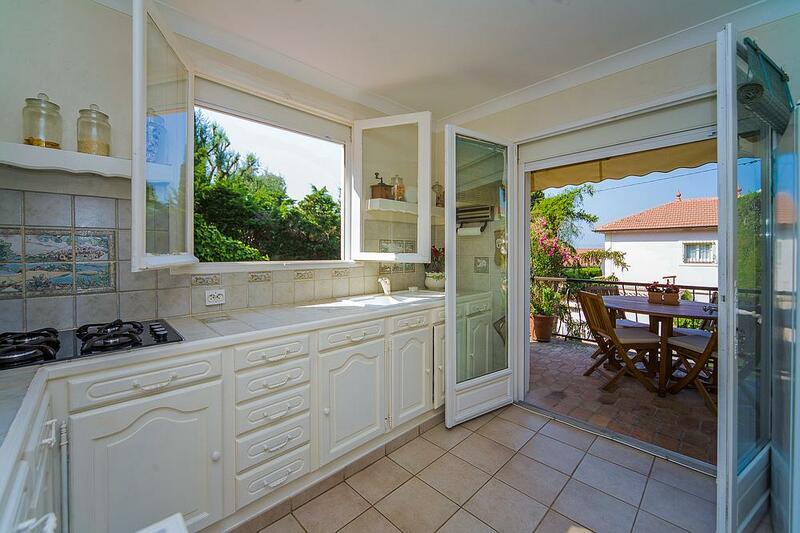 Well equipped kitchen, air-conditioning, opening onto balcony terrace with outdoor dining. 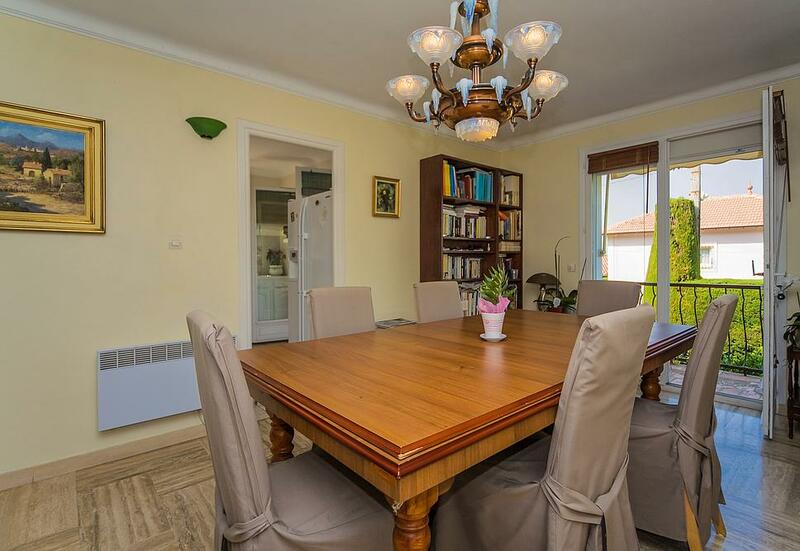 Games/dining room with billiard/dining table, TV (accessed from the kitchen). 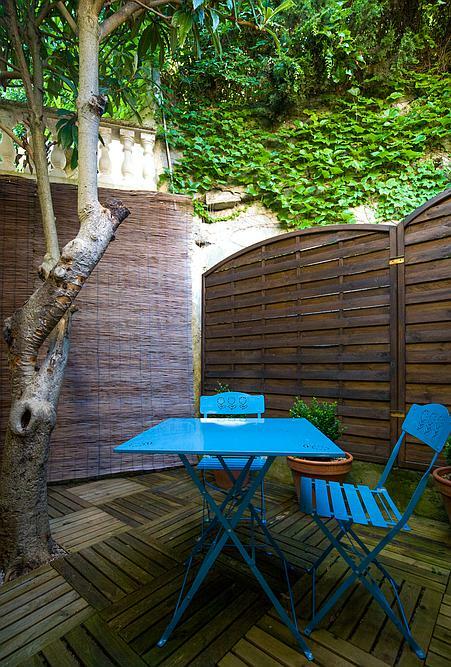 French doors to balcony terrace. Air-conditioning unit in the hallway. 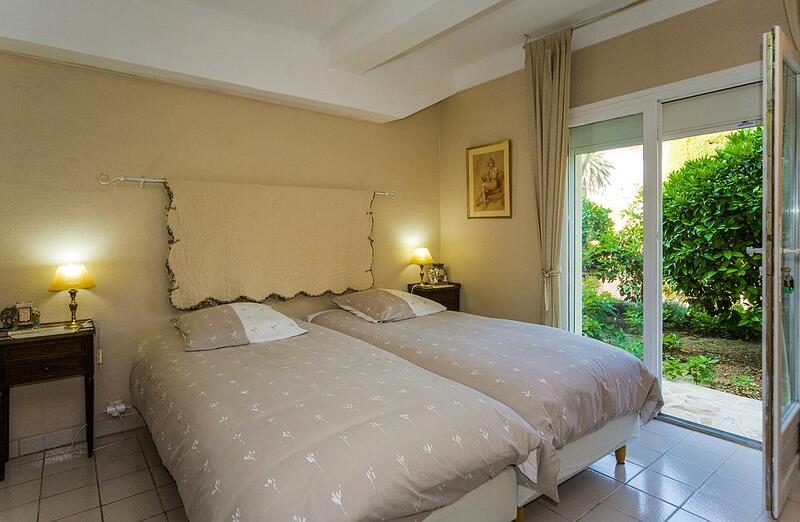 Master double/twin bedroom (1.80m/ 2 x 0.90m) (TV), French doors to small decked patio, ensuite bathroom, WC. 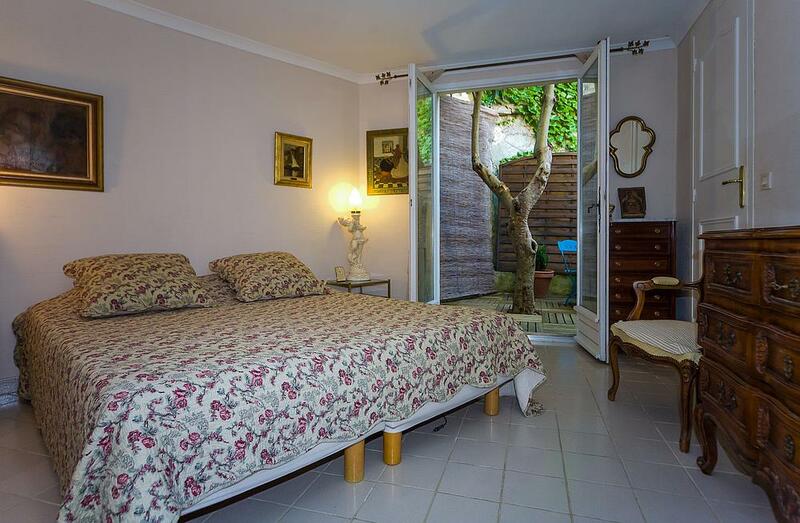 Double bedroom (1.40m), patio doors to garden. 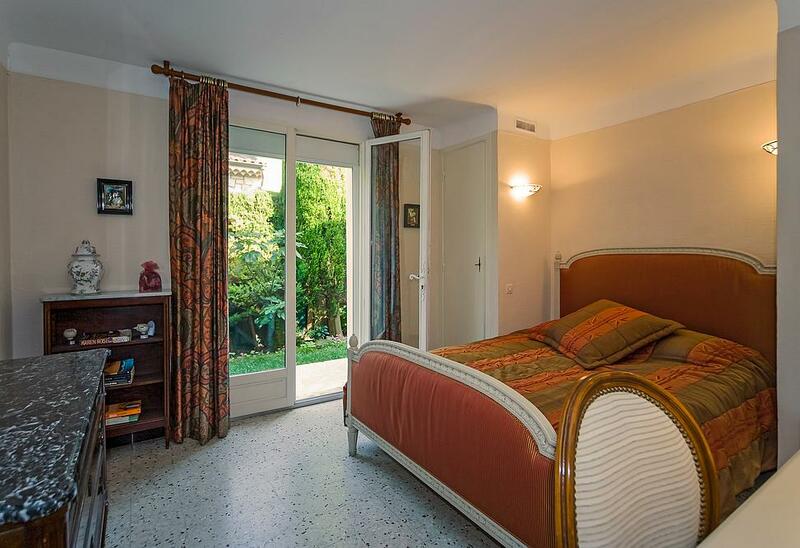 Twin bedroom (2 x 0.80m beds), patio doors to garden. 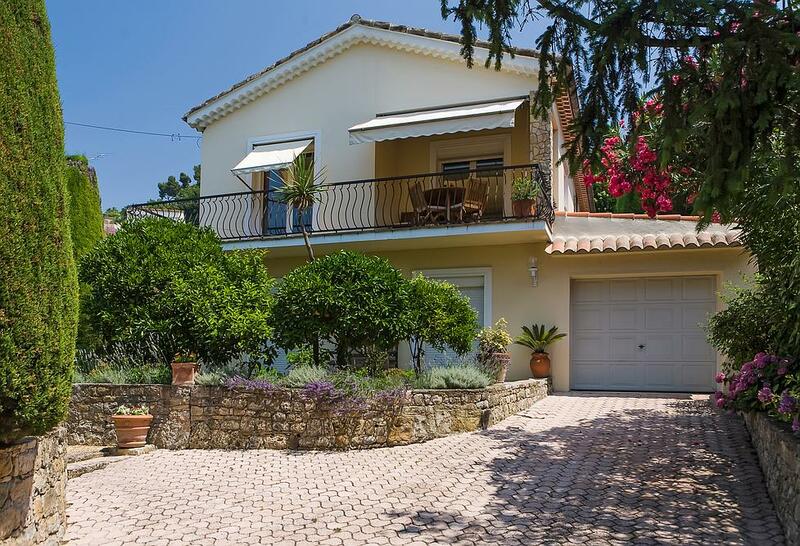 Delightful town garden on two levels (steps - care with young children) totally enclosed, well stocked with plants and well maintained. 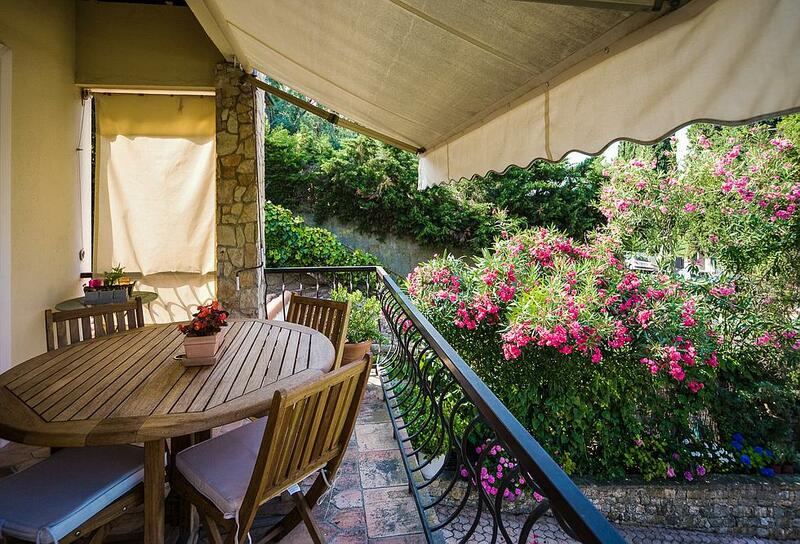 Private 8.6m x 4.3m kidney-shaped pool surrounded by lawn area, outdoor dining facilities, portable gas barbeque.